Between the Gulf Freeway and Hwy 3 on Bay Area across the street from Carrabbas. When you go out for a meal, how difficult is it to find a place everyone can agree on? Tastes can vary widely in even the closest family. That won't be a problem if you come to BJ's Restaurant & Brewhouse, located in Webster, TX. We have a wide selection of almost every style of food. If you're in the mood for a lighter fare we have house made soups, sandwiches, and garden fresh specialty salads. For meals under 795 calories, we offer BJ's EnLIGHTened Entrees®. For a heartier appetite, you will want to try our pasta favorites, handcrafted burgers, or USDA steaks and ribs. We also offer an exceptional pizza selection, including BJ's Signature Deep Dish Pizza. If you're avoiding gluten, we have added a gluten-free section to our menu. Our substantial menu, courteous and efficient staff, and relaxed dining atmosphere are just a few ways we are always Pursuing Amazing™. Another way in which we are Pursuing Amazing™ is in our fully stocked brewhouse. Our brewers are both talented and completely committed to the perfection of their craft. Year round they are working on delicious seasonal beers, as well as keeping a large selection of fan favorite beers always on tap. These include the flavorful HopStorm® IPA, Nutty Brewnette® and Jeremiah Red®; the bold BJ's PM Porter® and Tatonka® Stout; lighter favorites such as LightSwitch® Lager; and sweeter offerings like Berry Burst Cider® and our handcrafted root beer. For something really special, try our limited edition BJ's Brewmaster's Reserve™ offerings. 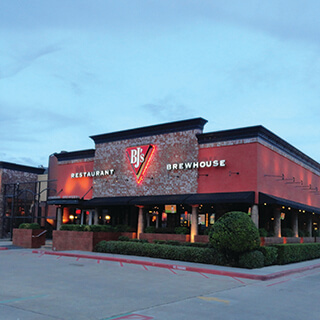 If you live in Webster, TX, and want to enjoy great food and great beer in a fun, casual atmosphere, visit BJ's Restaurant & Brewhouse. "At the Gateway to the Bay Area and NASA our restaurant provides a great place to meet for good food and great craft beer!"